Booth 4: Ready for the weekend? 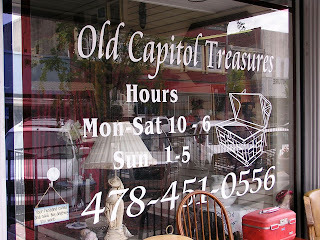 We are-- and we're hoping your weekend plans include a visit to Old Capitol Treasures. If you love browsing through flea markets, thrift stores, and antique malls-- then this is the place. We are open from 10-5 Monday-Saturday and 1-5 on Sunday. Come see for yourself, it will be a unique shopping experience. And while you are downtown, check out the 2012 menus at some of your favorite restaurants. Downtown Milly offers the complete shopping and dining experience, so come on down, we think you will be glad you did!